To enjoy the amazing panorama of nature’s beauty, Jeep Safari is the best way - An unforgettable experience as the road traverses a variety of landscapes and one can hardly put the camera away. On the way you can stop and take pictures and feel the difference. 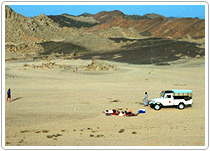 On the way nature impresses with awesome mountain passes of above 16 - 18,000 feet high, long stretches of flat land, cold deserts without a trace of vegetation, amazing natural rock formations and deep gorges of the rivers. 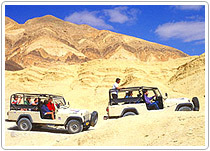 One of the very famous Jeep Safari among the travellers is Manali – Leh Jeep Safari crossing many high passes on the way. Starting from green surroundings of Manali you will cross Rohtang pass into Spiti valley and camping on the flat land of Sarchu and travelling into the mountain desert of Ladakh and finally reach Leh. The Manali to Leh road is only open for 2 - 3 months from end of June to September every year before the snows cover it up and wash away the road. Trail blazers India have a well maintained fleet of jeeps and our experienced and expert drivers who are trained to drive safely are also well versed with the routes, customs and traditions of the local people. Our drivers main objective is to give you a relaxed and enjoyable time in the Himalayas and to help in all aspects of your journey. Manali -Keylong - Sarchu- Upshi - Leh. Manali- Keylong, Lahaul Valley -Sarchu -Pang - Tso Kar lake - Tso Moriri Lake - Mahe Bridge - Leh, Ladakh. Arrive Manali in the morning and transfer to hotel. Full Day leisure to explore the Himalayan town of Manali . Overnight in hotel. After breakfast, drive to Keylong / Jispa over the Rohtang Pass (3980 M). Reach Keylong / Jispa and check into hotel. Evening at leisure. Overnight at hotel. After breakfast, drive to Sarchu over Baralacha Pass (4830 m). Arrive Sarchu and check into tents. Evening at leisure & Overnight in tents. After breakfast, drive to Leh over Lachungla (5019 m) and Tanglang La (5360 m) to reach in the evening. Check into hotel. Overnight. After breakfast, full Day at leisure to explore Leh. Overnight in hotel. After breakfast, drive to the highest motorable read in the world- Khardungla Pass (5360m) to return back by noon. Evening at leisure. Overnight in hotel. After breakfast, transfer to airport for flight at 0735 hrs. Arrive Delhi at 0850hrs.